With the world of e-sports expanding every day, there are many who develop expertise and experience in different kinds of virtual games that takes considerable mental skill and capabilities. Most games create their open virtual community such as League of Legends, Mortal Kombat or Starcraft 2 where players can play against each other, compare scores and collect virtual money, rewards and use them within the community. However, every gaming community remains secluded and players gain prominence or can establish their credibility only in limited spheres. They need to prove their abilities and skills every time they wish to play a new game on a different platform or of a genre. How about a matchmaking app that helps you gain credibility and recognition for wins in different games that can add to your game playing expertise as a whole in the virtual gaming world? 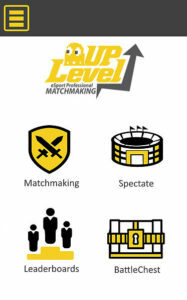 It is a unique concept that is offered by Level Up eSports which is a gaming match making app. This app will help you find matches and competitors to challenge and win over. Every time you gain a win you gain expertise or XPER which can be used as a digital currency like BitCoin in the digital world. You need to start off on the app by creating a profile. It can be that of a team or a single user account. Select the systems you would be competing on such as Android, PS4 or PC. You can create a logo or an avatar for your account. You need to specify the servers you would participate on. If you wish you could provide other biography details. Once the above step is done, you are ready to use the match making functions. Match making can be done in two modes, farming and professional. It is less risky to match make in farming mode as you do not have risks of losing XPER. For every win there is a certain amount of XPER that is awarded to the winner. Once you have understood the basics of the match making app you are ready to start. Go through the different profiles available. In order to find a match swipe through the profiles of players that are visible to you. When you find a suitable opponent you can challenge them and they need to accept the challenge. You could also chat with your opponent in order to time and coordinate other details of a match that you would like to play. Once a game is played and the players are agreeable about who has won, the details can be uploaded and the winner will get XPER awarded to their account. In case there is a dispute the software will help to resolve the matter when screen shots of the games and stats are uploaded. The XPER allow you to play games on different communities and this crypto currency can be shared with others as well.